Visualizing deep into the dermal layers to help recommend accurate treatment. 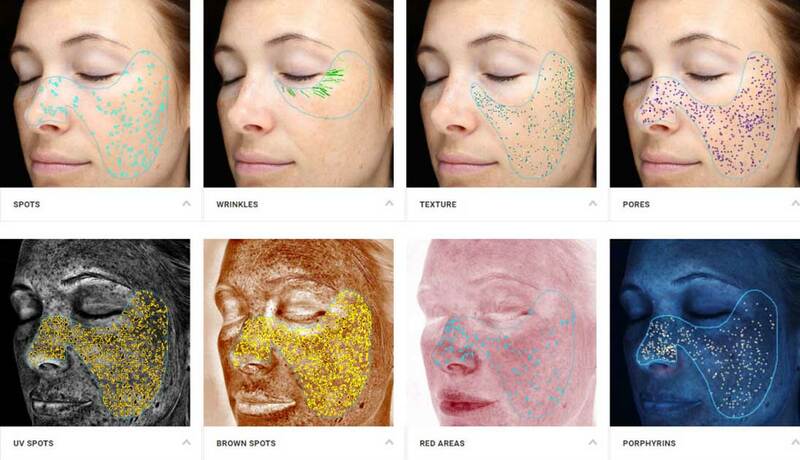 The VISIA complexion analysis photography system is the most advanced imaging tool for clinical skin analysis. The targeted complexion analysis gives evidence of your current skin condition by visualizing deep into the dermal layers and recommending accurate treatment. The in-depth examination of individual facial characteristics makes it possible more than ever before to design skin care and facial rejuvenation for your exact complexion needs. Most precise assessment of skin tone and pigment variations. Creates multiple facial views, and archives assessment reports with notes. Maps, measures and analyzes fine lines, wrinkles and sun damage —shows clear images with color variations that exhibit texture. The only commercial optical imaging system with all-digital 3D spectral analysis, w.hich helps us successfully monitor your progress. The VISIA complexion analysis photography system uses 3D spectral imaging, targeted complexion analysis and triple light source analysis to demonstrate the actual skin condition in a way that helps give precise treatment recommendations. The high-quality photos are sent to a computer that calculates the standard and UV photos through analysis software. The results are plotted on a diagram with your picture, which helps you see how your complexion relates to the average complexion of your demographic. The complexion analysis photography system screen shows your face’s treatment area in natural light, UV light, and polarized light images. The natural light image will highlight pores and wrinkles; the polarized light will display spots and pigmentation; the UV shows porphyrin and sebum below the surface. These images help us develop a fine-tuned treatment plan and let you see why we might recommend certain treatments.